If God has not delivered you from a problem yet, know He is faithful. Deliverance may look different than you expect, however. Karlton shares. Has that been been your experience? Have you found that even though you have gone through many troubling things, many difficulties and trials, that the Lord has delivered you from them all? I can testify that yes, I have been through many terrible afflictions and trials, but the Lord has delivered me from them all. Even as someone made righteous by the sacrifice of Christ, you are going to have troubles, problems, many afflictions. That is not a popular message, but we all know it is true. If you live on this earth, you are going to have problems. Even Jesus was not free of troubles while on this planet. The danger is that we can get so focused on our afflictions that we forget the second part of that verse–that the Lord will deliver us out of our troubles. Even though we have the pain of affliction, we also have the promise of deliverance. The fact that you are alive on this earth means the Lord has delivered you from something. No one likes trouble, and as our troubles add up we can become crippled by fear and overwhelmed by adversity. We need help, comfort, encouragement, and deliverance from our many afflictions. Thankfully we can call upon the Lord to deliver us, and indeed we must call upon Him to survive these many afflictions. This week you may find your adversities piling up and piling on. While the Lord does not promise problem-free living, He does promise deliverance from and through your many afflictions. Ask Him for help, call upon His Name, and He will help you through your many troubles. Prayer: Dear Lord, the troubles can pile up and overwhelm us, please deliver us, give us strength, and help us through our many afflictions. Amen. Karlton Douglas lives in Ohio with his lovely wife. He has seen many troubles, but he has also seen the Lord deliver him out of and through them all. Are you overwhelmed by affliction? 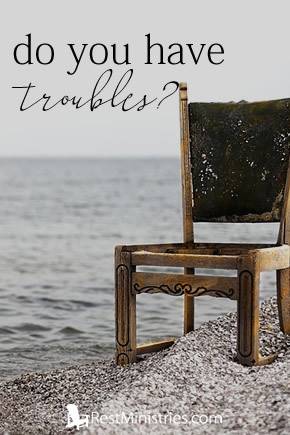 Do you have too many troubles to endure? Ask Jesus to deliver and help you through your many troubles. 4 Responses to Do You Have Many Troubles and How Will God Step In? It is sometimes a struggle to focus on the end result rather than current difficulties. Yet it is helpful when we count all of our victories through Christ. Karlton, I love the truth that you share in your devotionals. I was saying Amen, too! Looking to Jesus the Author and Finisher of our faith.